In times of plenty, the uni-cellular slime mold Dictyostelium discoideum leads a solitary life munching on bacteria littering the forest floor. But these simple creatures can perform heroic developmental acts: when the bacterial food supply dries up, Dictyostelium amebas band together with their neighbors and form a multi-cellular tower designed to save the children. 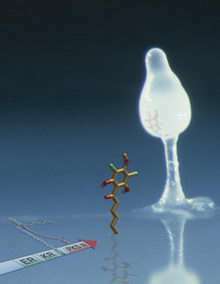 In a forthcoming study in Nature Chemical Biology, investigators at the Salk Institute for Biological Studies and the Medical Research Council of Molecular Biology (MRC) in Cambridge, England, use traditional and computer-based methods to show how Dictyostelium synthesizes the chemical signal called DIF-1, short for Differentiation Inducing Factor, required for this developmental transformation. When slime molds starve, they collectively form a multicellular slug-like creature that locomotes en masse to a warm spot. There, in response to the DIF-1 signal, slugs literally stand up and their cells metamorphose into either a column of stalk cells or next-generation spore cells, which perch atop the column waiting for food supplies to be restored. Turns out, DIF-1 belongs to the same crowd. “While reading a review article on the diversity of polyketides in the journal Nature, we realized that the core chemical structure of DIF-1, an important developmental signal in Dictyostelium, is similar to natural products made by plant type III PKSs,” recalls Austin. At the time, Dictyostelium was in the midst of having its genome sequenced, and the bits and pieces of raw DNA sequencing data were being deposited in publicly available databases. Austin recalled, “One night I performed a bioinformatics search to look for genetic evidence that would suggest the existence of a type III PKS in Dictyostelium.” Using various computer programs to find, assemble, and translate in silico the relevant raw DNA sequencing fragments first into genes and then into the proteins these genes encode, Austin reconstructed two type III PKS-like gene sequences, and also found a surprise. Unexpectedly, these deduced genetic blueprints for type III PKSs revealed each Dictyostelium type III PKS to be fused to other enzymatically active protein domains. This never seen before hybrid arrangement works like a very efficient bucket brigade that synthesizes polyketide molecules in slime mold cells. “Nature has paved the way to exploit this novel domain arrangement to bioengineer more efficient ways of making modified polyketides for human uses,” said Austin. Moving to the bench, Austin and Noel lab manager Marianne Bowman isolated Dictyostelium DNA encoding the type III PKS domains and not only determined their structure, which indeed resembled a plant PKS, but also showed that one of them, called Steely2, made the chemical scaffold of DIF-1 in a test tube. All that was left was to prove that slime molds themselves used the newly discovered enzyme to make DIF-1. Kay replied that he and co-lead author Tamao Saito, PhD., a scientist on sabbatical in his lab, had also focused on these unusual type III PKS genes following the recently completed final assembly and annotation of the entire Dictyostelium genome, which was carried out by a worldwide collaboration of many scientists, including the Kay group. Working independently, Saito and Kay had deleted the Dictyostelium gene for Steely2. Not only could the resulting "deficient" slime molds not make DIF-1 but they couldn’t construct the rescue tower, which was exactly the biological corroboration that the Noel lab wanted to hear. The two labs pooled data and now publish their work as one, very complete story while continuing to collaborate on the chemical diversity found in this fascinating organism that crawls around on the forest floor. Also contributing to the study were Steven Haydock, MD, who worked with Kay, Atsushi Kato, who along with Saito is now at Hokkaido University in Sapporo, Japan, and Bradley Moore, PhD., at Scripps Institute of Oceanography. How close are we to a cure for Huntington's?